In the News - Contract Solutions, Inc.Contract Solutions, Inc.
Contract Solutions Inc. (CSI) CEO and President Corliss Udeoma was recently featured in an interview by The Washington Business Journal staff reporter Soe Han Tha. Continue reading here. Prince William Living Magazine published its annual winners of its Influential Women Award on February 28, 2019. Corliss Udeoma, founder and CEO of Contract Solutions Inc. was selected as one of five recipients of the award based on her leadership and championship of community causes... Continue reading here. Contract Solutions Inc. (CSI) has been named to Washington Business Journal's Largest Corporate Philanthropists by Volunteer Hours - Small Company list. Manassas-based CSI was ranked #2, with 4,000 volunteer hours and $263,000 in giving by the publication, based on 2017 volunteer hours. Continue reading here. A year after being named one of the nation’s fastest-growing companies by INC. Magazine, Contract Solutions Inc. has been celebrated as one of the fastest-growing in the Commonwealth of Virginia. CSI was recognized at The Virginia Chamber of Commerce’s 23rd annual Virginia’s Fantastic 50 Awards Banquet on April 26. Click here to continue reading press release. If you’re looking for a great group of people to work with and a company that supports you, we would love to hear from you! We look forward to hearing more about you! Send your resume today! 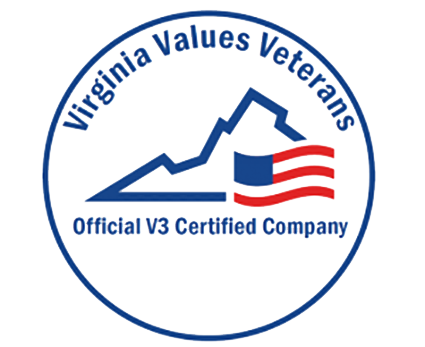 "CSI continues to set the tone for other companies to follow as a veteran friendly employer and how this opportunity can be achieved. The family atmosphere that CSI fosters includes the characteristics that we veterans consider to be of the utmost importance, ‘Honor, Courage and Commitment with Integrity as their foundation’. Thank you CSI family for the employment opportunity and to be considered as family!"